The Showtab is a Bandall innovation that teams perfectly with the 'Branding by Banding' concept by Bandall and Specialist Printer Max. Aarts. 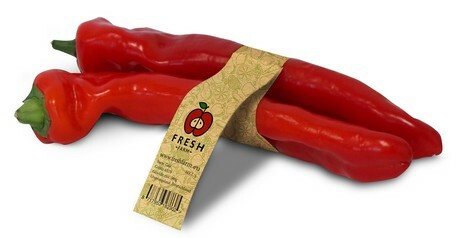 Growing in popularity in the produce industry worldwide, Branding by Banding seals and labels one or multiple products with a printed paper or film band. Add a further length of band to highlight more information, branding or promotional detail and we have the Showtab. Band, tab and print in one step, providing extra print space for branding, promotions or tracking, EAN and QR codes for a quick and easy scan solution. Bandall’s aim is to make it easy for producers to quickly implement the change to reduced packaging that is so necessary today. Offering alternatives to plastic bags, adhesive labels and other complex packaging in the AGF industry is the motive behind the design of the Showtab . Naturally, eco friendly banding materials are available, such as biodegradable, recyclable and compostable films and papers. Bandall’s Ultra Clean Seal (UCS) bans any requirement for adhesives. Papers are FSC approved, and banding directly onto foodstuffs with food approved inks makes Branding by Banding a versatile option. Banding and the Showtab are of the same material and can be pre-printed up to full colour. With the option to print variables onto the banding material over the full length and width in as many positions as required. This is done seamlessly during the banding process. Application of the band around single or multiple products, sealing on the Showtab and printing onto the banding is done in just 1 step. There is no interruption, slow down or down time for printing onto the band, regardless how much. Branding by Banding partner Specialist Printer Max. Aarts guarantees a compelling design combined with high quality 10 colour (digital) print options. Bandall is recognised for its almost 30 years of producing innovative and reliable banding equipment. Eco friendly options – biodegradable, recyclable, compostable – and no adhesives! Available in a vast range of papers and films. Meet us at the Fruit Logistica in Berlin (Hall 3.1, Stand B01). Bandall and Specialist Printer Max. Aarts have one goal – to help you to get the most out of your product communications.